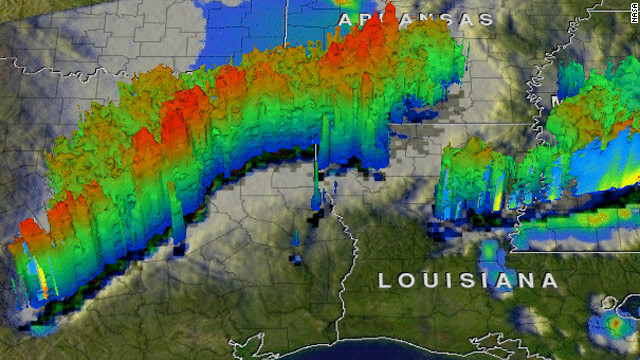 An image from the TRMM weather satellite shows just how incredibly high this week's storms climbed over the region. Once again, NASA offers us a brilliant perspective of Mother Nature’s fury! The animation above shows us a 3-D view from NASA’s Tropical Rainfall Measuring Mission (TRMM) Satellite of the storms that hammered the Dallas area and eastern Texas. Rainfall rates reached up to 2 inches per hour at times during the strongest storms, while those storms also spawned several tornadoes across the region. Some of these twisters were powerful enough to pick up entire big rig trucks. The stronger the storms are, the taller they are. In an average shower or weak thunderstorm, cloud tops can reach around 30, 000 feet high. When they're more intense, severe cousins develop like those across eastern Texas. Those cloud tops can reach to heights of 50,000 to 60,000 feet, or about 10 miles high! Tuesday’s storms towered over eastern Texas higher than about 8 miles, or around 42,000 feet. Even the storms that were developing across eastern Louisiana and southern Mississippi reached to heights of around 7 miles. While we know several of these storms were tornadic as they passed across eastern Texas, these images cannot indicate whether storms are severe, and certainly not if they are producing tornadoes. We still need the traditional radar to see if a storm is rotating or to determine if it is severe. But what we can do is see the intensity of the precipitation underneath those storms and estimate the height of the cloud tops. This TRMM satellite is part of a joint mission between NASA and the Japanese Space Agency, JAXA. It orbits the globe about 16 times a day - about every 90 minutes. There are three instruments on this satellite, and the most innovative of those allows us to see these storms from a 3-D perspective. It's called the precipitation radar. This instrument is what gives us a vertical profile of precipitation from the surface to a height of about 12 miles. It can detect precipitation as light as 0.7 millimeters per hour and can also detect frozen precipitation as the satellite orbits the Earth at about 250 miles above the surface. TRMM is not just for looking at thunderstorms over land, but it's also a great tool for viewing tropical systems above open oceans. Researchers do use other satellites to study tropical systems, but TRMM can provide a 3-D view of these storms and offer detailed information on the intensity and structure of precipitation in and around the eyewall, as well as the outer rainbands. Wow! Incredible photo of an giant storm! TOMG: Did it ever dawn on you that people who type in ALL CAPS spread bad karma all over the universe or are you one of the people struck by lightening but nobody told you? DON'T THINK OF EVIL ACTION OR DON'T THINK OF DEVIL ACTION THAN ONESELF LIFE FORM WILL BECOME MORE BEAUTIFUL HUMAN BEING ON ONESELF APPEARANCE AND HAVE MORE PEACE AND HARMONY TO ONESELF LIFE THAT ALL IT TOOK , BUT MOSTLY PEOPLE ARE TOO STUPID TO THOUGHT OF THAT WH THE BAD KARMA WILL ALWAYS ON TO THEM , AMEN . BY LOVING NATURE OF LIFE FORM SUCH AS ALL KINDS OF DIFFERENCES OF TREE AND BIRDS AND ANIMAL IS THE ONL TICKET TO HELPING ONESELF TO SAW THE REAL HEAVENLY PLACE THAT ALL , AMEN , AND THE COMPASSION COMPASSION COMPASSION TO HELPING ONESELF TO GETTING TO THE MOTHER LAND THE REAL HEAVENLY PLAVE THAT ALL , AMEN . HUMAN FORM ARE SO STUPID IT TOOK ONESELF ACTION OF MISTAKE INORDER TO AWAKENING ONESELF KARMA ACTION , AMEN . KARMA WHAT COME AROUND WILL GOING BAC AROUND ARE REAL AND FOR REAL NO ANIMAL AND HUMAN FORM CAN GET AWAY WITH IT FROM THE STUPID AND EVIL ACTION THAT CAUSE ALL THE AFFECT WILL BE COMING AFTER ONESELF ACTION OF THINKING AND THE THOUGHT OF TO HELPING ONESELF TO GOING TOWARD THE HELL WORLD , AMEN . WE ATE ALL KIND OF ANIMAL MEAT TO FEED OUR BODY FLASH , BUT WHEN OUR BODY IS PASSING AWAY IT TURN INTO TO SO STINKINGLYSMELL AND STINK , AMEN . ALBERT EINSTEIN IS THE REAL LIVING GOD , AMEN . HE IS REALLY CHANGING THIS CRAZY WORLD AND EVIL HUMAN MIND TO RETHINKING WHAT ONE ACTION CAN REALL AFFECT THE WHOLE COUNTRY AND TO THE WORLD ALSO , JUST LIKE THE FIRST BUDDHA FROM INDIA COUNTRY CAN AFFECT TO THIS STUPID HUMAN KARMA WORLD DOES FOR MORE THAN 2255 YEARS ALREAD AND STILL NOT AWAKENING ET HOW REALLY STUPID WE ALL ARE AT THE MOMENT OF TIMING , AMEN . EVEN THE MOST GENIUS MAN ALBERT EINSTEIN HAVE BEEN MENTIONING ON THIS CRAZ WORLD IS ONLY THE BUDDHISTISM TO FIX TO STUPID ANIMAL HUMAN WA OF THINKING TO HAVE MORE PEACE THAT ALL , AMEN . TO THE ONE WHO DOES HAVE THE INTEL AND BELIIVED IN THE GOD KARMA WORLD THAN THOSE WILL HAVE MORE PEACE AND HARMONY LIFE THAN TO THOSE ANIMAL MIND THAT DON'T EVEN KNOW ABOUT WHAT CAN THE KARMA BE TRUELY CAN AFFECT ON ONESELF REAL TRAGIC LIFE TO THE FUTURE OF ONESELF ACTION OF TIMING TO HAVE THE REAL CAUSE AND AFFECT BACK TO ONESELF BODY AND MIND , AMEN . OUR HUMAN LIVER ORGAN WILL BE GIVEN BACK TO THE IRON METAL WORLD WHEN ONESELF IS PASSING AWA , AMEN . OUR HUMAN KIDDNEY WILL BE GIVEN BACK TO THE WOOD WORLD WHEN ONESELF IS PASSING AWAY , AMWN . OUR HUMAN HEART ORGAN WILL BE GIVEN BACK TO THE FIRE WORLD WHEN ONESELF IS PASSING AWAY ,AMEN . OUR HUMAN STOMACH ORGAN WILL BE GIVEN BACK TO THE SOIL EARTH WORLD WHEN ONESELF IS PASSING AWAY , AMEN . OUR HUMAN LUNG ORGAN WILL BE GIVING BACK TO THE AIR WORLD WHEN ONESELF IS PASSING AWA , AMEN . AND SO DOES THE MOON LUNAR POWER ARE THE HIGH TIDE AND LOW TIDE AFFECT ON THE CRAZY HUMAN FORM MIND AND BODY AND THE THINKING TO HELPING ONESELF GETTING TO THE MOTHER LAND OF THE INVISIBLE WORLD . HUMAN EYE CAN NOT SAW THE AIR THAT WE ALL ARE CONSTANTLY BREATHING INHALE THE FRESH AIR AND EXHALE THE TOXIC AIR CONSTANTLY INORDER TO STAYING ALIVE AND UP FLOW , AMEN . THE SUN SOLAR POWER ARE ONLY THE REAL GOD OF ALL CRAZY AND STUPID RELIGIOUS NOW DAILY ARE BRAIN WASHING THE STUPID HUMAN FORM HELL WORLD , AMEN . HUMAN FORM WILL BE GETTING THE FULL AFFECT FROM THIS NATURE TRAGIC MORE TO COME AND NOT JUST GETTING STARTED BUT IT WILL CONTINUE TO HAVING THIS KIND OF CRAZY WEATHER WILL ALWAS BE KEEP ON COMING UP UNTIL OUR HUMAN ANIMAL FORM MINDEDLY TURNING OUR BACK TOWARD GOD INORDER TO HAVE GOD HELPING OUT THAT ALL ,AMEN ..
HUMAN LIFE FORM ARE JUST THE SAME AS THE HUMAN WASTE AND URINE THAT HAVE BEEN FORMING THOUSAND AND THOUSAND OF YEARS ALREADY NOT JUST NOW ON THE DAILY AFFECT OF IT , AMEN . IS THE SAME WAY AS SAIDING HUMAN WASTE ARE TASTE GOOD AND HUMAN URINE ARE THE BEST TASE WHEN ONESELF IS DRINKING IT BACK FROM THE URINE FLUIT , AMEN . IS BEEN CALLED THE GREAT GREEN HOUSE AFFECT TO THIS EIGHT MILES CAUSES FROM OUR STUPID HUMAN FORM KARMA TO HAVE THIS EIGHT MILES HIGH CAUSE AND TO HAVE THE TRUE AND REAL AFFECT BACK INTO THE HUMAN MANKIND AND WOMANKIND OF CRAZY KARMA WORLD , AMEN . THIS WORLD ARE ROUND AND WILL CONSTANTL GOING AROUND AND AROUND AND THAT JUST PROVE TO THE HUMAN CRAZY STUPID WORLD THAT KARMA CAN REALLY DOES ALL THE CAUSE FROM THE FIRST STEP OF ONESELF THINKING AND THE THOUGHT OF TO HELPING WHERE ONESELF WILL BE GOING FOR THE HIGHER GROUND OR THE LOWER GROUND , AMEN . . . THE SUN SOLAR POWER ARE ROUND ALSO , AND SO DOES THE MOON LUNAR POWER ARE ROUND ALSO , AND THIS CRAZY EARTH FORM WORLD ARE ALSO ROUND , AMEN . REINCARNATION BAB , AMEN FULL OF KARMA ARE JUST AWAITING FOR OURSELF MIND OF THE WA WE ARE STUPID ENOUGH TO GO AHEAD AND KEEP ON THINKING BAD HABIT WAY OF STUPID LKIFE FORM IN THE FIRST PLACE WAY OF LIFE , AMEN . I have read all your posts, and you make absolutely no sense whatsoever, nothing you have said has anything to do with what the article is about. You really need to think before you post!! They should write these articles using metric units. Great goods from you, man. I've bear in mind your stuff previous to and you're simply extremely excellent. I actually like what you have bought right here, certainly like what you're saying and the way wherein you say it. You make it entertaining and you still care for to stay it sensible. I can't wait to read far more from you. This is really a great site. That was a Texas Storm in Texas. Wow- whata "brilliant" picture. Im sure its worth every cent of the cost to develop and launch the satelite that took it! Its amazingto think that with modern tech we can see the tops of clouds! lmao! You're making fun but it's the science and technology that helps warns people and saves lives. There's nothing funny about that.